Best practices & how-to tips for installing a Massaranduba deck. Massaranduba is famously known as Bulletwood and Brazilian Redwood. Massaranduba is very dense hardwood, attractive, low-maintenance and long-lasting. To make the most of this decking material, we recommend using specialized or higher grade tools. For instance carbide-tipped saw blades and stainless steel decking screws are recommended during installation. Below, is a general overview of handling and building suggestions to help achieve great results when building your Massaranduba deck. Click HERE to go to see our Massaranduba Decking prices. Massaranduba is a very dense, very hard wood. Use of some specialized or higher grade tools may be necessary for good results. This page will give you an overview of handling and building directives that will help you achieve the best results when building your Massaranduba deck. Always check with local building codes and an architect prior to constructing. Follow all building codes that apply in your area. Since there are many different variables one can encounter on an installation project, it is your responsibility to test the material for suitability for your project prior to constructing. Follow all manufacturers' installation instructions for the individual products used on the project. If any building codes or manufacturers installation instructions contradict or differ from information provided by AdvantageLumber.com, contact us for written clarification prior to starting your project. Our Massaranduba decking is kiln dried to a moisture content of approximately 14-16% for outdoor use. Kiln dried Massaranduba lumber is suitable for many outdoor applications such as decks, siding, benches, docks, playgrounds, flower boxes, and other outdoor furniture. Our standard and pregrooved decking are both great choices for many outdoor deck and dock applications. Massaranduba decking should be allowed to sit where it will be installed for 7 days prior to installation in order to get acclimated to your local temperature and humidity levels. DO NOT store the decking directly on the ground, or directly on top of a concrete surface. DO NOT store the material for more than 30 days prior to use without first consulting with a sales rep at advantagelumber.com that your storage conditions are optimal. The decking should be elevated at least 12" off the ground during acclimation. To ensure the bottom boards are well ventilated, place the decking on top of blocks of wood. DO NOT cover decking material with plastic or a tarp during this acclimation period. Covering with a tarp/plastic will trap moisture in and cause stability issues. Covering the top of the pile with a sheet of plywood to shed the water is recommended. Keep material dry until installation. Also keep stickers (or wood shims) between layers of boards to allow proper air flow. DO NOT store the material in a garage or any other enclosed area. Ensure the deck substructure is pitched away from the house to allow for adequate water runoff. We recommend a minimum pitch of a 1/4" per 10 ft. for proper drainage on Standard and Pregrooved decking. For Tongue and Groove decking, a more aggressive pitch is recommended. We highly recommend using a 1/4" per foot slope. Framing material should be installed with the crown up (humps up) to aid in water draining off the surface material. 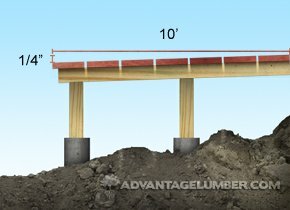 Framing lumber can crown 1/8" or more, and may lead to standing water. Any standing puddle of water can cause surface decking to cup. Installing hardwood decking above a concrete pad is NOT recommended. Hardwood decking should never be installed directly over concrete due to moisture retention. Any hardwood decking installed over a new or aged concrete pad will cause the deck boards to cup and/or crown. When installing Massaranduba decking, be sure to leave a 1/4" gap between deck boards. This gap spacing may be adequately achieved by selecting the appropriate Ipe Clip® brand edge mount fastener which completes both functions of fastening and spacing the deck boards at the same time. The difference in gap spacing is to ensure that the decking has room to expand and contract depending on the material used and the environment where it is installed. This also allows for proper air circulation. Average shrinkage is approximately 1/8" on 4" wide boards and 1/4" on 6" wide boards. Shrinkage may vary depending on climate, installation site, and method of use. The deck design should allow for adequate cross ventilation underneath the deck to ensure stability, prevent cupping, prevent surface checking, and minimize the natural movement of the wood. We recommend a minimum of 18" of open air under joists along with open sides for proper cross ventilation. If you install skirting around the perimeter of the deck it is imperative that the skirting does not prevent cross ventilation. Do not allow standing water to collect under the deck. Ensure that the ground is adequately sloped under the deck to eliminate standing water under the structure. Installing hardwood decking above a concrete pad is NOT recommended. Hardwood decking should never be installed directly over concrete due to moisture retention. Any hardwood decking installed over a new or aged concrete pad will cause the deck boards to cup and/or crown. Due to the very hard nature of Massaranduba, premium carbide tipped saw blades are recommended for cutting. Brad point drill bits or fostner bits provide cleaner holes than standard HSS twist bits. Our Massaranduba decking is shipped with the end grain sealed with a clear wax to prevent any end checking and adverse movement . Fresh cuts should be sealed within 24hrs with end grain sealant. We sell end grain sealant by the quart, which is typically enough for 500 sq.ft. of decking. The end grain sealant is simply applied with a paintbrush and dries clear. DO NOT apply end seal to the surface of the decking. Any sealant that gets on the surface should be wiped off immediately. Use only stainless steel fasteners to fasten hardwood decking or dimensional hardwood. Use of fasteners or screws made of anything other than 305 or higher grade stainless steel will cause unsightly staining and discoloration to the wood around the fastener and the fastener could corrode and fail prematurely. When fastening deck boards pre-drilling is required. Pre-drill all your holes with the appropriate sized drill bit for your screw size. Failing to predrill can cause the wood to split which can cause irreversible damage to the deck boards and make the boards come loose over time. The use of Ipe Clip® hidden deck fasteners to fasten the deck boards is highly recommended. Ipe Clip hidden deck fasteners keep the deck surface blemish free. This deck fastening system also allows the wood to expand and contract on its width without putting undue shear pressure on the screws when wood expands/contracts. Using Ipe Clip® hidden deck fasteners instead of face screwing can help keep water from penetrating the surface of the wood. Ipe Clip® deck fasteners also helps keep the deck surface splinter free. If you choose to install decking using Ipe Clip® hidden deck fasteners, please refer to and follow the installation included in the system's packaging. Because of Massaranduba's natural density and alkaline characteristics, many oil and water based finishes will not dry properly when applied. We recommend that you test any product on several sample boards to determine compatibility. The finish we sell and recommend is Ipe Oil™. We do not recommend the use of other finishes. Applying a finish approximately every two years (depending upon your local climate) can help keep the beautiful dark brown color. If you decide to let your deck weather, it will turn a silvery gray similar to teak. We recommend that you apply a coat of finish initially after deck installation, regardless of the final color desired. This can help ensure that the Massaranduba retains its oils and stability. 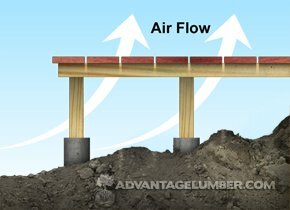 For low ventilation applications, we recommend finishing deck boards on all four sides prior to installation but after acclimation. If the need arises to glue your Massaranduba, waterproof glues, such as Gorilla brand polyurethane can be used with satisfactory results for gluing plugs into deck boards. Epoxy glues are also very suitable and can be dyed to black, brown or other colors to match your Massaranduba deck. Epoxy produces a very strong waterproof bond, particularly important for gluing posts. WHICH DECKING PROFILE IS RIGHT FOR YOU? For traditional outdoor, uncovered decks. 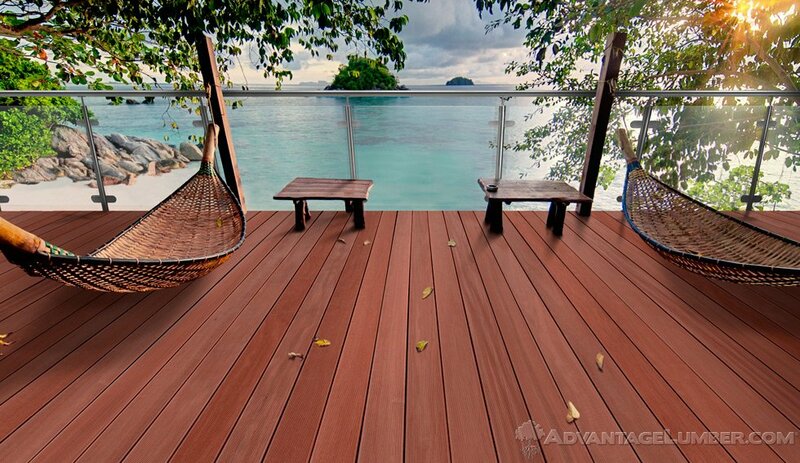 Our standard and pregrooved decking are a perfect choice for outdoor decks and docks. When installing outdoor decking be sure to leave a gap between deck boards of 3/32”. The difference in gap spacing is to ensure the decking can expand and contract freely. Ipe Clip® Installation: The Ipe Clip® system uses high strength plastic clips that insert into slots cut into the edge of the deck board which then rests on top of a joist. A stainless steel screw (supplied with each Ipe Clip® fastener) is then screwed in diagonally into the joist. We recommend the Ipe Clip® system as many other fastener systems install from the bottom side of the deck, requiring screwing into the bottom of the deck board. With the Ipe Clip® system no screws or holes show from the surface. Click for more info about the Ipe Clip Installation Process. Face Screw / Plug Method: Countersink 3/8" holes into face of deck boards. Pre drill 1/8" pilot holes completely through the deck boards. Screw the deck boards down with stainless screws. 3/8" Massaranduba plugs are then glued into the holes with waterproof glue (i.e. Gorilla brand glue, Epoxy, etc.) Plugs are then knocked off with a chisel and sanded smooth with 80 grit sandpaper ( a round orbit sander works great). Massaranduba plugs are milled in 3/8" diameter with a small taper. Above is an example of standard Massaranduba Decking installed with the face screw/plug method. Finish Screw Method: Stainless steel decking screws are screwed into the face of the decking. Recommended two per joist. The trim head screw is very small and only slightly noticeable. Star drive screws will strip out less than square drive. For use on covered porches & patios only. Enjoy Your Deck Year-Round... Decks are not just for summertime anymore! We now offer our customers Massaranduba Tongue & Groove Decking. T&G decking will need to be installed directly on top of the floor joists, not on a sub floor as the material will need cross ventilation underneath it. The material will need to be under cover and have a pitch to allow for drainage. For installation we suggest that you pre drill a hole on a 45-degree angle where the tongue and the face meet, you will see a slight v-groove in this corner. Then, on that same 45-degree angle drive a trim head screw through the pre drilled hole, through the deck board into the floor joist. We carry a large variety of stainless steel decking screws that a perfect for this application. The trim head screws are required because the head will sink into the corner where the v-groove is. This sinking action will allow the next deck board to slide into place and will perfectly conceal the previously installed screw head. Above is an example of Tongue & Groove Massaranduba Decking installed. You must contact your local building department before you begin designing your project. Your local building department (and/or Homeowner Association) will inform you of any zoning ordinances and buildings codes that specify where and how you can build. You are responsible for applying for and obtaining any and all required permits for your project. 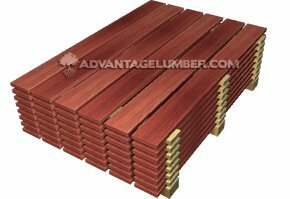 Advantage Trim & Lumber Co. provides this information as possible suggestions only and will not be held liable for your project's suitability or should you choose not to obtain the required permits, or if you fail to comply with all zoning ordinances and building codes. If you have any questions, contact us for written clarification prior to starting your project. By purchasing material from AdvantageLumber.com, you agree to comply with our Terms & Conditions. Click HERE to go to see the available sizes and Massaranduba Decking prices.